For the collection, see Ebonhold collection. Not to be confused with [Archeus] or [Archus, Greatstaff of Antonidas]. Acherus: The Ebon Hold (pronounced ACK-er-us) is a former Scourge necropolis floating above Light's Hope Chapel in the Eastern Plaguelands. It is the headquarters of the Knights of the Ebon Blade and is the starting area for all death knights of the Alliance and the Horde. As such, the Ebon Hold has been designated as a sanctuary, with PvP combat forbidden within its halls. Shrouded in mist over the Broken Shore. Built by the skeletal architect Obrahiim and said to be so powerful that not even the dread citadel of Naxxramas would be able to withstand a direct assault, Acherus was first deployed in a region of the Eastern Plaguelands east of Tyr's Hand known as the Scarlet Enclave. Here, under the direct command of the Lich King, the death knights of Acherus were trained in its halls for a specific purpose: the destruction of both the Scarlet Crusade and the Argent Dawn, the last bastions of Light (albeit corrupted, in the case of the Scarlet Crusade) in the Plaguelands. Within the halls of Acherus were mounds of bodies, the corpses of slain heroes gathered by the Scourge to resurrect as death knights. Under the watchful eye of the feared Instructor Razuvious, Scourge necromancers raised bodies chosen by the Instructor and gauged for their worthiness. If they were found worthy, they were attired in the trappings of a "herald of Arthas"; if they were found wanting, they were consumed by hungry ghouls. Also present inside are runeforges, where death knights emblazon their weapons with runes that better aid them in their battles against their enemies. In the Heart of Acherus, other unworthies were kept in chains for initiates to slay in cold blood as part of their training. Given their task, the death knights of Acherus laid waste to the towns of Havenshire and New Avalon and destroyed the last standing army of the Scarlet Crusade before turning on Light's Hope. During the Battle for Light's Hope Chapel, the Lich King revealed that he sent the death knights on a suicide mission in order to lure Tirion Fordring out of hiding. After the Lich King fled back to Northrend when Fordring cleansed the Ashbringer, the death knights who remained on the field formed the Knights of the Ebon Blade under the command of Highlord Darion Mograine, and took control of Acherus from the Scourge to serve as their base. Acherus now hovers above the destroyed Scarlet lands as the base of operations for the Knights of the Ebon Blade, still containing many of the newly freed death knight trainers. Darion resides at the center, vowing for revenge against the Lich King. Naxxramas' recent return to Northrend prevents Acherus from actually proving the theory that it could destroy it, but many Scourge nevertheless have been rooted out of the ruins below the necropolis, and the Scourge banners have been replaced with the banners of the Ebon Blade. Darion has taken to periodically journeying to the battlefield at Icecrown to meet with Argent Highlord Fordring and aid adventurers from both sides in the front-line battle against the Scourge. With the war effort now focused entirely on Northrend, Acherus has been quiet since the battle against the Scourge. Its trainers still teach the finer points of the dark arts to their acolytes as they gain in strength, but the Ebon Hold itself remains a silent, ominous shadow in the hellish orange skies above Light's Hope. The Class Hall loading screen in Legion. In the wake of the Burning Legion invasion, the new Lich King contacted the Knights of the Ebon Blade and the two parties formed an alliance against the invading forces. Acherus initially moved close to Icecrown Citadel in order to have their hero reclaim the remnants of Frostmourne to reforge them into a pair of new blades with the Lich King's blessing. 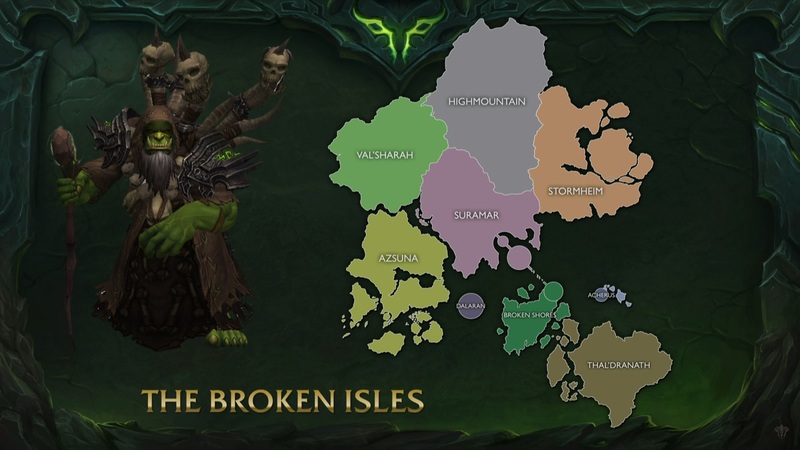 Acherus then moved to the Broken Isles, where it hovers above a chain of small islands overlooking the Broken Shore and the Tomb of Sargeras. As a side effect, the chill winds emanating from the Hold condensed the air around it, creating a beneficial mass of fog that hides it from the prying eyes of the Legion. The only way for non-death knights to enter Acherus is by flying; if you are at least level 60 with a flying mount, and have a [Flight Master's License], you may freely enter and leave. If you're not a death knight, clicking on the flight master Grimwing will "teach" you a new flight path, but attempting to use it brings up the message that you don't know any other flight points connected to this one, even if you actually do. All the vendors will sell to you whether you're a death knight or not, except for Dread Commander Thalanor, whose only item for sale — [Winged Steed of the Ebon Blade] — is for death knights only. As they are all Knights of the Ebon Blade, reputation discounts for that faction will apply. Acherus was the only sanctuary in the Eastern Kingdoms, and indeed for all of the old world, preceding the implementation of order halls. On PvP realms, if you happen to be in the Eastern Plaguelands, flying up to Acherus would guarantee your safety from opposing players. It also applies as a rest area. Landing on any surface of Acherus horizontal enough to support standing, whether inside or outside, will count. If you try to fly to the Broken Isles version of Acherus without being a death knight, a guard riding a Winged Steed of the Ebon Blade will put you in chains and fly you back to Dalaran. There are several books in Acherus, many containing praises for the Lich King and the power of the Scourge. There is one, however, that can be found in the back of the main floor beside the runeforge closest to the merchants, where new death knights are being created. The book contains a list of several new death knights and on the final page contains the name of the player with a comment about them. In the Broken Isles version of Acherus, several demons can be seen under experimentation. Amal'thazad has a wrathguard, an observer, and a pair of imps frozen in place, while Lord Thorval keeps a squirming felguard chained down to a slab. The guards in the Broken Isles version of Acherus wield a variety of weapons, such as [Kiril, Fury of Beasts], Heart-Lesion Blade, [Ramaladni's Blade of Culling], [Glorenzelg, High-Blade of the Silver Hand], [Oathbinder, Charge of the Ranger-General], and recolored versions of [Wrathful Gladiator's Decapitator] and [Greatsword of the Ebon Blade]. Reminiscent of the quest  Death's Challenge from the Death Knight starting zone, several Knights of the Ebon Blade can be challenged to a duel on the upper floor of the Broken Isles version of Acherus. Acheron, meaning "river of woe", is a river that runs in northwestern Greece, and is connected to various underworld myths. In Greek mythology, the river Acheron was a branch of the river Styx; Acheron was the border to Hades, and those seeking to enter Hades had to pay Charon, the ferryman, for passage. Those who could not were condemned to wander the banks of the Acheron for one hundred years. In his epic Aeneid, the Roman poet Virgil uses "Acheron" to refer to all of Hades, and says the following to the main character, Aeneas: "Flectere si nequeo superos, Acheronta movebo" ("If I cannot deflect the will of Heaven, I shall move Hell"). Acheron was also described as the river that formed the border of Hell. In the Inferno, book one of his Divine Comedy, Dante Alighieri - given a guided tour of Hell by Virgil - meets Charon at the banks of the Acheron and pays for passage across (at Virgil's insistence and despite Charon's reservations, as Dante was still a living man during his journey through Hell). This page was last edited on 14 February 2019, at 05:25.